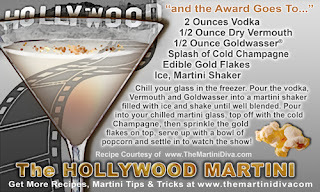 This Oscar Martini has double bling! The Goldwasser, a root and herbal liqueur, has flecks of gold floating in it and then you sprinkle some more edible gold flakes on top for a garnish. There's even a little sparkle from the splash of Champagne so you have a perfect martini to celebrate with the winners this coming Sunday. Created in 1598, Goldwasser was the favored drink of Catherine the Great and was believed to be an elixir with magical properties. Surrounded with stories involving Neptune and alchemy, Goldwasser has an interesting back story which you can read about at Gdansk Life. Did you know that the Best Picture was originally awarded as Best Production? Though the Awards were presentations started in 1927, the first awards ceremony was held in 1929. The very first Outstanding Picture was awarded to two films, Wings for Best Production and Sunrise for Unique and Artistic Picture - a category that was dropped after the first year. The very first Best Picture was awarded to Wings. Titanic (1997) and All About Eve (1950) both hold the record for the most nominations (14) earned by a single film. The Lord of the Rings: The Return of the King (2003), Titanic (1997), Ben-Hur (1959) are the three Best Picture winning films with the most Oscars wins (11).